Manchester United's controversial American owners are not "ogres" but a "down to earth close-knit family", according to the man responsible for managing their public image during their takeover of the club 10 years ago. The Glazers, led by their late billionaire businessman father Malcolm, bought United for £790m in a leveraged deal in May 2005, which immediately put the club into £660m of debt. A decade on, with the club worth £1.8bn and debt halved to £380.5m, Tehsin Nayani has detailed his six-year relationship from 2005 to 2010 with the secretive family, who have not given an extensive interview in almost 10 years, in his book 'The Glazer Gate Keeper'. So close was Nayani to events involving United, he witnessed Sir Alex Ferguson sitting on a silver crate in the breakfast room of United's team hotel in Moscow in 2008 "grinning like a Cheshire Cat" knowing it contained the Champions League trophy won against Chelsea the previous night. Although he opens his book with the line "The Glazers may not be the ideal owners of Manchester United", Nayani accepts it is written from a sympathetic standpoint towards the Americans, even though it was done without their, or United's input. They were, however, told "as a matter of courtesy". In putting together his 323-page account, Nayani went through thousands of cuttings, emails and text messages, plus his own recollections of the unique access he had. From the outset, Nayani had to battle against an extremely negative perception of Manchester United's new owners from fans, supporters groups and some media outlets. They were not trusted because of the amount of debt they had saddled a club that had been the most profitable in Britain with. "It was often difficult to look beyond the customised portrayal of them as sinister cartoon bogeymen," says Nayani. Malcolm Glazer bore the brunt of the ridicule and contempt, "usually accompanied by an unkind caricature of him as a leprechaun". MUST (Manchester United Supporters Trust) were at the forefront of the opposition to the Glazer family prior to their takeover. Afterwards, they organised concerted campaigns against the Glazers' Automatic Cup Scheme, which forced season-ticket holders to buy tickets for home cup games for the Champions League and FA Cup, plus the League Cup, although the latter requirement was subsequently dropped. MUST were also behind the green and gold campaign, when they called on fans to wear the colours of Newton Heath - the team Manchester United grew out of - in response to fears over the future of the club. The fears were sparked by a number of financial warnings contained in the prospectus for the club's 2010 bond issue, including what even Nayani accepts was a "mind-boggling" £38.6m loss from an interest rate swap and the potential sale of the club's training ground, which would serve as a "call to arms". MUST's stance has since softened, with United executive vice-chairman Ed Woodward meeting the organisation's chief executive Duncan Drasdo in 2013. Such a meeting was unthinkable to Nayani during his time with the Old Trafford club. "In all my time with the club I never contacted or engaged with any of the Supporters Trust's representatives. I did not trust them and was never keen to debate the merits [or otherwise] of debt." "He [Nayani] is spouting even more drivel now than he did when he was working for the Glazers." After returning to Old Trafford to play for AC Milan in a Champions League game in 2010, David Beckham was making his way towards the tunnel to a standing ovation when he picked a green and gold scarf up off the pitch and draped it round his neck. With that one gesture, the world's most recognisable footballer gave visual support to the colours adopted by the anti-Glazer movement. "I immediately grabbed my Blackberry, scrolled through my address book to JG and pressed the green icon," recounts Nayani, who had left the stadium for his Manchester hotel long before the final whistle. "Joel, are you watching what I am watching?" Far from being alarmed or worried at the development, Glazer was calm and measured in his response, first stating "is it so bad? ", then realising Nayani was still frantic at the protestors getting such a world-famous 'poster boy', reasoning: "Football is a passionate business. Won't it blow over? It has always blown over in the past. "Sure some fans are angry and protesting inside Old Trafford but from where I am sitting there are many millions of fans happy that the team are through to the next round." According to Nayani, the phone exchange concludes with Glazer doubting the actual sentiments were as serious as they appeared to be, even though almost five years earlier he, along with brothers Avi and Bryan, had been spirited out of Old Trafford in the back of a police van for their own protection. 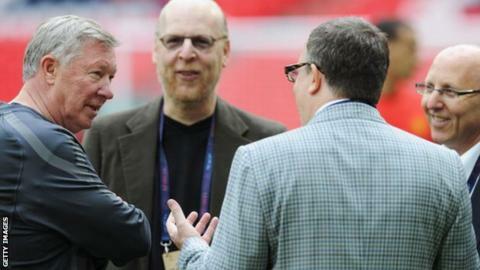 "I get that some fans don't like us but to hate us, it's such a strong word," said Joel Glazer. "To hate us when the club has been so successful, it's extraordinary." It has frequently been suggested the Glazers were looking to sell United, yet according to Nayani, the family never considered the prospect. Instead, they have set about driving up commercial revenues, which rose from £49m in 2005 to £189m in 2014, 44% of the overall £433m income. Working closely with the Glazers, Woodward took charge of an expanding sales team in London which soon outgrew office space in Belgravia, moved through Pall Mall and Mayfair and in addition to central London, now boasts an office in Hong Kong and soon there will be another in New York. Two of the biggest deals during Nayani's time were the shirt sponsorships of AIG and Aon for £56.5m and £80m - both UK records - for four-year terms from 2006 and 2010 respectively. AIG replaced Vodafone, who terminated its contract two years early. Looking back, sources accept the news was greeted negatively by senior figures inside the club. Nayani says Joel Glazer did not share that view, believing Vodafone's decision to withdraw represented an opportunity "to seek a new sponsor at a more lucrative rate". To recruit Aon, United sent a mock-up shirt bearing the name of each company to a long list of suitable candidates that had been drawn up by the club. Despite their fresh thinking with new marketing strategies designed to boost the club's profits, the Glazer family were generally maligned by fans and observers alike and Nayani says, compared unfavourably to the then Liverpool owners, George Gillett and Tom Hicks, who were far more engaging with the media. "The Glazers did seem disinterested in Manchester United, the lack of media interviews was at best interpreted as indifference, or at worst, not even caring for the club," Nayani writes. However, the truth, according to Nayani, was the opposite, with the Glazers having a clear vision about how United could be a success, "on and off the pitch". The 'Not for Sale' mantra never changed. Even more than MUST, Nayani reserves his most pointed criticism for the 'Red Knights', a group of investors who put together a strategy for buying the Glazers out in 2010. Early in 2010, it was reported the Red Knights had met in London to discuss a potential £1bn bid for the club. Nayani felt it was "incredibly naive" for the Red Knights to go public quite so soon, particularly as their own funding had not yet come close to being secured. He noted with irony that debt would be required for any realistic bid to be made by them and was humoured at the way the group maintained their offensive even after it became obvious they could not succeed. "Like their Black Knight counterpart in Monty Python and the Holy Grail, they would stubbornly refuse ever to give up despite having all their limbs dismembered," Nayani writes. The Glazers have offered so little in public about their ownership of Manchester United that Nayani's testimony can only help shed some of the mystique surrounding them. In the early days at least, Nayani was uncomfortable with the Glazers' lack of engagement with the media. Soon though, the view was replaced by an "admiration" for the family's natural modesty and an "understanding" of why they would want to avoid spending a significant amount of time with "demanding" journalists. Depicting a consistently calm and measured approach to events at the club, Nayani reveals that Joel Glazer did, however, lose his temper at his family's treatment by the media only twice. It first happened when it was suggested Sir Bobby Charlton was about to be jettisoned - "he is Manchester United" was the reaction from Glazer - the second when a recollection made to MUTV about watching Rochester Lancers, a soccer team in New York, was questioned - "this is my childhood" he retorted. The insight into the Glazer family's "lateral", fresh approach to sponsorship shows, from the early days, the potential they had seen. And now, with an enormous new Premier League TV deal and record shirt sponsorship and manufacturing contracts signed with Chevrolet and Adidas, the perceived threat to United has disappeared. The club's value continues to rise and, approaching a decade since their takeover was concluded, the Glazers' foresight has been rewarded. Whether that is enough to convince those who so bitterly opposed the takeover - and claim in excess of £700m has been taken out of the club in various costs associated with it - that the family may have been right all along is another matter entirely.